Another key decision that must be made during the planning phase is what contract type to utilize. Unlike the method of procurement, that determines how you are going to solicit bids for the project, the contract type will determine how the bidders will price the goods, services or construction and the contracting environment that will govern the contractual relationship between the State and the Contractor post contract award. Based on market research the Procurement Team should have a good idea how the contractor industry prices work similar to your requirement. This market research will be critical in helping you determine the contract type to solicit. The Hawaii procurement code allows for a number of contract types including everything from a firm-fixed price or lump sum contract to a time and materials contract. See HAR 3-122 Subchapter 16 for a list of contract types. The key factor that drives what contract type should be used on any given project is the level of project risk and how to fairly allocate that risk between the State and the Contractor. The chart below shows a continuum of contract types and the associated risk level to either the State or the Contractor. The fixed price contract is the only type of contract that can be used in competitive sealed bidding. It places responsibility on the contractor for the delivery of the goods or the complete performance of the services or construction in accordance with the contract terms at a price that may be firm or may be subject to contractually specified adjustments. It is appropriate for use when the extent and type of work necessary to meet the purchasing agency’s requirements can be reasonably specified and the cost can be reasonably estimated, as is generally the case of construction or standard commercial products or some services. There are two types of fixed price contracts. The firm fixed-price provides a price that is not subject to adjustment due to variations in the contractor’s cost of performing the work specified in the contract. It should be used whenever prices which are fair and reasonable to the purchasing agency can be established at the outset. The fixed-price contract with price adjustment provides for variation in the contract price under special conditions defined in the contract, other than customary provisions authorizing price adjustments due to modifications to the work. The formula, pricing index or other basis by which the adjustment in contract price can be made must be specified in the solicitation and the resulting contract. Adjustment allowed may be upward or downward only or both depending on the requirement. An indefinite quantity contract, where the unit price is set but the total number of units may not be set, is a type of fixed price contract. The cost-reimbursement contract, provides for payment to the contractor of allowable costs incurred in the performance of the contract and as provided in the contract. It establishes at the outset an estimated cost for the performance of the contract and a dollar ceiling which the contractor may not exceed, except at its own expense, without prior approval or subsequent approval by the Procurement Officer. It has a provision whereby the contractor agrees to perform as specified in the contract until the contract is completed or until the costs reach the specified ceiling, whichever occurs first. It is appropriate when the uncertainties involved in contract performance are of the magnitude that the cost of contract performance cannot be estimated with sufficient certainty to realize economy by use of any type of fixed-price contract. It is particularly suitable for research, development, and study type contracts. This contract type necessitates appropriate monitoring by agency personnel during performance to provide reasonable assurance that the objectives of the contract are being met. The proposed contractor’s accounting system is adequate to allocate costs in accordance with generally accepted accounting principles. The cost-plus-fixed fee contract is another type of cost-reimbursement contract. It provides for payment to the contractor of an agreed fixed fee in addition to reimbursement of allowable incurred costs. The fee is established at the time of contract award and does not vary whether or not the actual cost of contract performance is greater or less than the initial estimated cost established for the work. Thus, the fee is fixed but not the contract amount because the final contract amount will depend on the allowable costs reimbursed. The fee is subject to adjustment only if the contract is modified to provide for an increase or decrease in the scope of work specified in the contract. The cost-plus-fixed fee contract can be either a completion form or term form. The completion form is one that describes the scope of work to be performed as a clearly defined task or job with a definite goal or target expressed and with a specified end-product required. This form of cost-plus-fixed fee contract normally requires the contractor to complete and deliver the specified end-product as a condition for payment of the entire fixed-fee established for the work and within the estimated cost if possible. However, in the event the work cannot be completed within the estimated cost, the agency can elect to require more work and effort from the contractor without increase in fee provided it increases the estimated cost. The term form is one that describes the scope of work to be performed in general terms and that obligates the contractor to devote a specified level of effort for a stated period of time. The fixed fee is payable at the termination of the agreed period of time. Payment is contingent upon certification that the contractor has exerted the level of effort specified in the contract in performing the work called for and that the performance is considered satisfactory by the purchasing agency. Specific milestones which are definable points in a program when certain objectives can be said to have been accomplished. In no event should the term form of the cost-plus-fixed fee contract be used unless the contractor is obligated by the contract to provide a specific level-of-effort within a definite period of time. The cost-plus-a-percentage-of-cost contract is another type of cost-reimbursement contract. Prior to completion of the work, the parties agree that the fee will be a predetermined percentage of the total cost of the work. The contract provides incentive for the contractor to incur cost at the expense of the State since the more the contractor spends, the greater its fee. 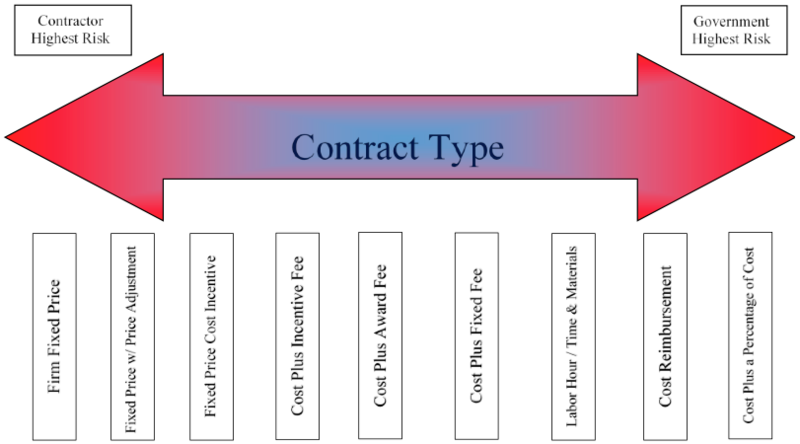 Cost-reimbursement and cost-plus-a-percentage-of-cost contracts may only be utilized when the Procurement Officer determines in writing that the contracts are likely to be less costly than any other type of contract or that it is impracticable to obtain the goods, services, or construction required except by means of the contracts. They are prohibited if their use would jeopardize the receipt of federal assistance funds or reduce the amount of the assistance under any applicable federal statute or regulation. Notice is conspicuously posted in an area accessible to the public in the office of the Procurement Officer and available for public inspection during normal business hours. For HRS 103F the SPO has established cost principles for purchases of Health and Human Services. Please refer to the SPO website under the Health and Human Services section. The cost-incentive contract that provides for the reimbursement to the contractor of allowable costs incurred up to the ceiling amount and establishes a formula whereby the contractor is rewarded for performing at less than target costs or is penalized if it exceeds target cost. The profit or fee under the contract will vary inversely with the actual, allowable costs of performance and consequently is dependent on how effectively the contractor controls cost in the performance of the contract. The fixed-price cost incentive contract is one type of cost incentive contract. The parties establish at the outset a target cost, a target profit, a formula that provides a percentage increase or decrease of the target profit depending on whether the actual cost of performance is less than or exceeds the target cost, and a ceiling price. After performance of the contract, the actual cost of performance is arrived at based on the total incurred allowable costs as provided in the contract. The final contract price is then established in accordance with the formula using the actual cost of performance. The final contract price may not exceed the ceiling price. The contractor is obligated to complete performance of the contract, and, if actual costs exceed the ceiling price, the contractor suffers a loss. It permits the establishment of a firm ceiling price for performance of the contract that takes into account uncertainties and contingencies in the cost of performance. It motivates the contractor economically since cost is in inverse relation to profit– the lower the cost, the higher the profit. It provides a flexible pricing mechanism for establishing a cost sharing responsibility between the State and contractor depending on the nature of the goods, services, or construction being procured, the length of the contract performance, and the performance risks involved. The cost-reimbursement contract with cost incentive fee is another type of cost-incentive contract. The parties establish at the outset a target cost, a target fee, a formula for increase or decrease of fee depending on whether actual cost of performance is less than or exceeds the target cost, with maximum and minimum fee limitations, and a cost ceiling which represents the maximum amount which the agency is obligated to reimburse the contractor. The contractor continues performance until the work is complete or costs reach the ceiling specified in the contract. After performance is complete or costs reach the ceiling, the total incurred, allowable costs reimbursed in accordance with subchapter 15 and as provided in the contract are applied to the formula to establish the incentive fee payable to the contractor. This type of contract gives the contractor a stronger incentive to efficiently manage the contract than a cost-plus-fixed fee contract provides. Prior to entering into any cost incentive contract, or any cost-reimbursed contract with cost incentive fee, the Procurement Officer shall make the written determination. In a performance incentive contract, the parties establish at the outset a pricing basis for the contract, performance goals, and a formula that varies the profit or the fee if the specified performance goals are exceeded or not met. For example, early completion may entitle the contractor to a bonus while later completion may entitle the State to a price decrease. In the circumstances, it would not be practicable to use any other type of contract to obtain needed goods, services, or construction, in the time required, and at the lowest cost or price to the purchasing agency. A labor hour contract provides only for the payment of labor performed. A labor hour contract shall contain the same not to exceed pricing ceiling as the time and materials contract. A labor hour contract also requires the same determination as required for a time and materials contract. After completing the necessary market research, the Procurement Team should update the original Procurement Strategy Plan based on the market research data. This can be done by updating existing components of the Procurement Strategy Plan or by adding additional information or sections to the original Plan. The goal is to document in a single place the information garnered during the market research phase as it impacts the procurement strategy (i.e., scope, schedule, budget, method of procurement, requirements, etc.). Remember your Procurement Strategy Plan is a dynamic document that should be updated as new information is received.